stoked! now mohawk bend, the massive beer bar and vegan-friendly restaurant in echo park, is now open at noon on saturdays & sundays for lunch. if you’ve been to mohawk, you probably know that it can get crazy busy at night (think 1-3 hour wait times! ), but we checked the bar out last weekend at noonish and it had a much more chilled out and relaxed vibe. 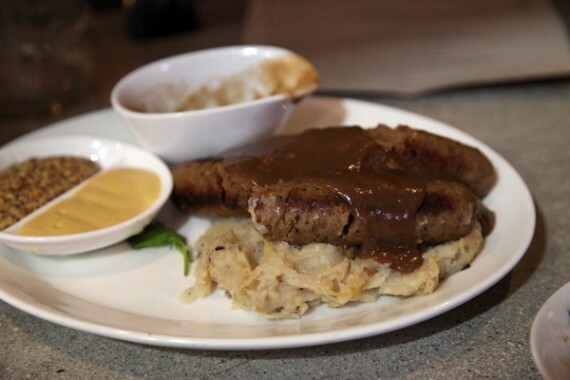 plus, a new vegan lunch option: bangers and mash! if you are in london this fall, consider yourself lucky. not just because you are in the best city on the planet, but because that means you have the chance to try the amazing autumn menu at manna cuisine in primrose hill. europe’s finest and oldest vegetarian restaurant offers a fresh, seasonal menu that changes every few months and this fall, all the selections are vegan, or at least vegan-optional. we had the pleasure of dining at manna a few weeks ago, and i can safely say it was one of the lovliest meals i’ve ever had. 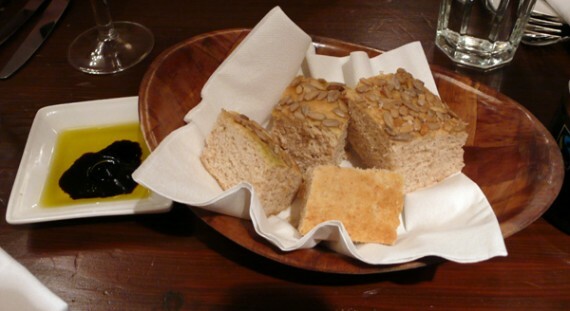 we started off with a side of organic bread, which is baked fresh at the restaurant daily. perfectly warm and fluffy with a side of olive oil for dipping, this really hit the spot. for our appetizer, we shared the quinoa and millet croquettes—pressed patties served on top of beetroot hummus with rocket salad and hazelnuts. the little cakes were beyond excellent with tons of subtle flavor and a texture that reminded me of falafel. the beetroot hummus was amazing, and also gorgeous with its bright red hue. the roasted hazelnuts were sweet and smokey, and added a perfect “holiday” taste to everything. we decided to split two entrees, starting with the organic bangers and mash. this dish came with two sausages made of fennel and pumpkin seeds, on a bed of carrot, parsnip, and dill mash….all topped off with crispy onion rings. 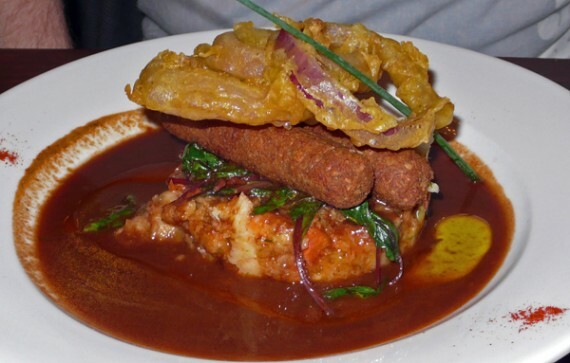 i have had loads of vegan bangers and mash in the UK, and i can say without a doubt that these were the fanciest and the best. 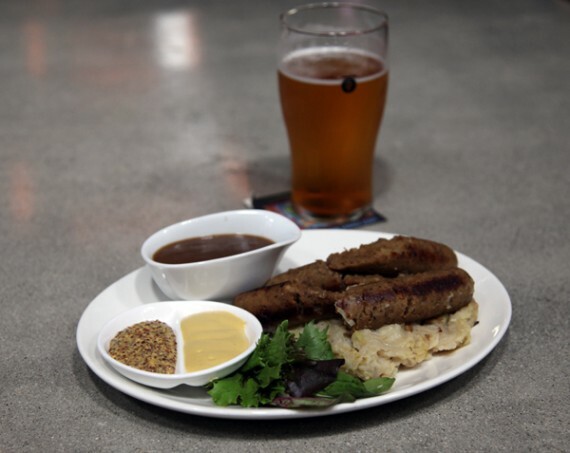 the homemade sausages were made of the finest ingredients, and the seeds gave them a really wonderful earthy taste. the mashed potatoes had several distinct vegetable flavors and were incredibly creamy…and the fried onion rings made for an awesome topping. this was the perfect gourmet version of an old school comfort food dish, i would eat this every single day if i could. 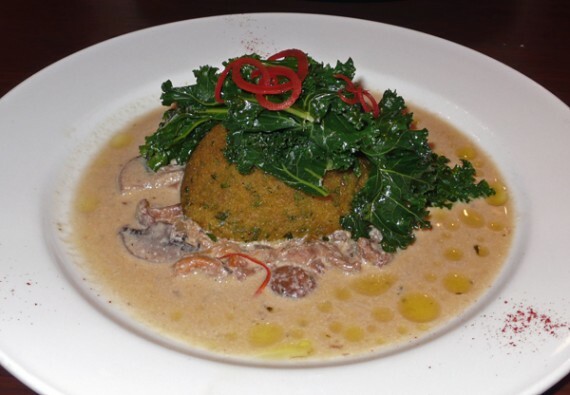 we also shared the saffron chestnut cake, which was served in a wild mushroom ragu with pan-seared kale. this thing blew me away after the first bite….i never knew vegan food could be this unique and beautifully presented. the tender cake was filled with perfectly-seasoned grains and nuts, and was a completely new taste. the creamy ragu was rich and decadent, and was great soaked up by the soft cake and eaten with bites of kale. for dessert we were really looking forward to trying the knickerbocker glory, an ice cream dish served with cake…but unfortunately, that was only available on the summer menu. (even though the online menu at the time still had it listed!) 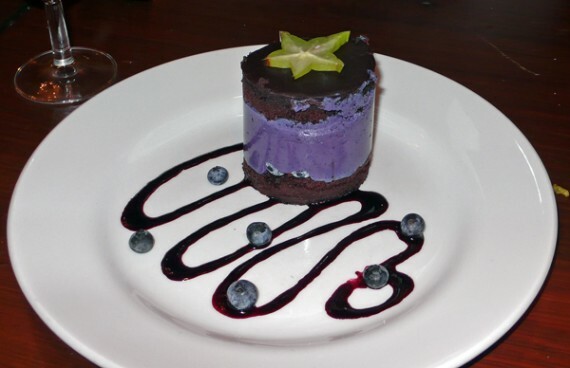 instead we went with the timbale, which according to the menu was a “chocolate sponge and cheesecake” combination. unfortunately, i wasn’t a big fan of this thing…it was very full of blueberries which weren’t listed in the description, and i don’t care for fruit in my dessert. oh well, i guess you can’t win them all—and the rest of our experience was spectacular. on top of the food being excellent, manna has very friendly service and a comfortable atmosphere. the place is pretty swanky with small tables and moody lighting, and i hear it can get pretty crowded so i would definitely suggest you make a reservation. on our way out, a friendly man who was unloading bags of food from his car asked us if we enjoyed our meal. we said we did, but made a comment about the knickerbocker glory not being available even though it was on the online menu. he immediately pulled out a business card and introduced himself as roger, the owner. he profusely apologized and said on our next visit we could get a free dessert. how sweet is that?! it made me even more sad that we were leaving to return to america the next day. as you can probably tell, i just can’t speak highly enough of manna. 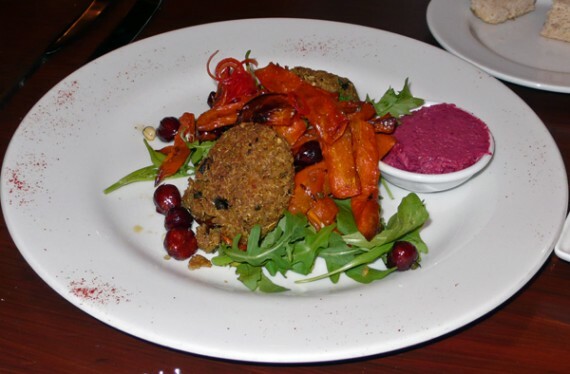 they really take vegan food to the next level with their creative dishes, and offer the kind of gourmet meatless dining that is very hard to come by. i will be sure to visit them as much as possible when i’m in england.